Whether you are in the process of buying or selling a home, one of the most important steps in this process is the home inspection. These inspections are designed to identify the condition of a home while also pinpointing specific areas that should be addressed. Infrared thermal imaging in home inspections is a technique used to discover defects in the building that can’t always be seen by the eye. Infrared thermal imaging uses an infrared camera to measure the surface temperatures within your home. The colors that are displayed on the tool range from red for warmer areas in the house to blue for cooler areas. By scanning your home with this tool, the inspector can see temperature differences that signify issues with the home. Some of the numerous problems that can be detected with infrared thermal imaging include heating systems that have become damaged, leaks within the compressor of your air conditioner, and any source of heat loss around the windows, walls, floors, and other areas of your home. Thermal imaging in home inspections is also designed to detect additional problems aside from standard heating and cooling ones, which extend from leaks in your plumbing to electrical equipment that has become overheated. It’s even possible for pest infestations to be located with this type of imaging, which is why it’s so important that you choose a home inspector who uses thermal imaging in home inspections. What Are the Benefits Of Infrared Thermal Imaging In Home Inspections? 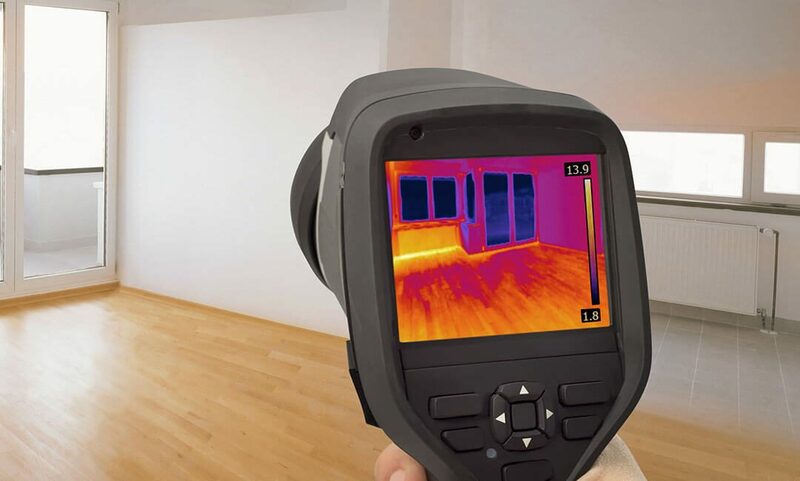 There are an array of benefits associated with thermal imaging in home inspections, the primary of which is the wide variety of issues that can be detected with this tool. By having a thermal imaging scan done on your home, you’ll have a more thorough home inspection report than one completed without a thermal imaging camera. If you’re selling your home, thermal imaging gives the buyer more confidence in purchasing the property once the inspection has been completed because there shouldn’t be any surprises once they’ve moved in. Before you select a home inspector to take a look at the property that you’re buying or selling, first make sure that they offer infrared thermal imaging with their home inspections. If you own the home that is going to be inspected with an infrared camera, there are steps that you can take to prepare for the inspection. For the inspector to obtain an accurate result in a short period of time, make sure that there’s no furniture pressed against the exterior walls of your home. It’s also recommended to have these inspections performed in the summer or winter because a strong contrast between the interior and exterior temperatures leads to the best results. Your specific inspector will be able to tell you whether or not you need to do anything more before the inspection occurs. Blueprint Home Inspections uses a FLIR® infrared camera and includes infrared thermal imaging in our home inspections to give you the most detailed report on the condition of your home. Contact us today to schedule your appointment in the Central Valley of California.